When you visit an Amish community, you expect to see fields of some sort of crop like corn. While you will see traditional grains sprouting in Amish areas of northern Indiana, you’ll also see fields of another crop–recreational vehicles, with row after row of the machines lined up outside the many factories and dealerships scattered about the region. The Elkhart-Lagrange and Nappanee Amish communities have long been dependent on the local RV industry. Amish have worked in it for years, and RV factory work has traditionally been the majority occupation for household heads in this area. In 2009, Elkhart and Lagrange counties had among the highest unemployment rates in the country (around 20%), in large part due to the downturn in this industry. During that period a number of northern Indiana Amish suffered financially. Some responded by starting home businesses to some degree of success. Some struggled to make home payments, though I have also heard on a number of occasions that some had their mortgages paid even a year in advance, and so were in relatively good straits financially. However a number of Amish were reported to have sought unemployment assistance. I just returned from northern Indiana two days ago. On two separate occasions during the week I spent in the area, Amish people used the word “booming” to describe the current state of the RV factories. Amish say that even today it is not quite like some years ago, when you could walk out of one factory and right into another. But finding a new RV job, or for some, any RV job, is not the challenge it was just a few years ago. RVs are doing well again and a sense of security, however fleeting it may prove to be, has returned. RV factory work is controversial among Amish, and you’ll hear different opinions on the industry. When I speak to people about work in the RV factories, three main points of concern typically come up. They are: 1) the money involved, 2) the work environment, and 3) stress. Money of course is not a negative in and of itself. It can be a very positive thing when used prudently, and there are wealthy Amish who have good family, community, and spiritual lives. And while RV work won’t make you rich, it can make you rather well-off. Some Amish in northern Indiana gross up to $2000 per week at RV pay rates of $35-45 per hour. One man I spoke with compared this to paid labor in Amish communities in Ohio, which is typically more meager (half as much or less), and wondered how they get by out there. Amish in northern Indiana typically have more disposable income than Amish people elsewhere. Though the Elkhart-Lagrange community varies in the church standards of its 150-plus congregations, the community’s standards of living are generally rather high. Driving through the area you see boats, trailers and other signs of prosperity on Amish properties. Like Amish in Ohio and Pennsylvania who have experienced windfalls from leasing land rights to energy companies, Amish sometimes wonder if this is a good thing for their communities. I noticed this firsthand when I lived and sold books in this area for four months in the summer of 2006. While there were some temporary layoffs going on even then, work was available and the situation was still relatively robust. In fact I did better here selling the Family Bible Library book set than in any other Amish community–not by a lot, but still better. This of course was a good thing for me. And if money is being spent on something that is “upbuilding” for the home like that set of books, it is probably a good thing for the Amish too. I guess it comes down to what is typically said in this situation: it’s not the money, but what you do with it (or maybe what it does to you). After all, the famous verse in 1 Timothy is not that “money is the root of all evil”, but rather “the love of money is the root of all evil”. Even with the best intentions, having a lot of disposable cash inevitably changes lifestyles. Coupled with the frenetic nature of factory work itself, one Amish small business owner and former factory worker observed that the industry had definitely affected the pace of life and the way Amish in the area lived. All RV factories are not created equal. I wondered which ones were more attractive to Amish workers and asked some Amish that question last week. Amish often say the work environment is an issue, with some places suffering from poor environments. “Poor environment” here typically means a “non-Christian” environment, as Amish describe it, with swearing and other unfavorable elements. While many Amish work in these factories, there are also many English workers. The presence of drugs may also be a concern. RV builder KZ, located off of highway 20 running just south of Shipshewana, was highly praised by one Amishman I spoke with. While the pay was described as “mediocre”, the environment, he noted, was quite good. Unlike a number of other companies, KZ is still in the hands of its original owners, which the man described as “Christian”. On the other hand, a number of RV businesses have been acquired by larger entities since the RV industry’s founding and subsequent growth in this area through the 1960s and 70s (for an interesting history of one RV company’s growth from being housed in a pair of chicken houses to becoming one of the world’s largest RV producers, see this history of Jayco). For example, today Warren Buffet’s Berkshire Hathaway owns the large Forest River RV company which employs many Amish workers. This doesn’t necessarily mean the company has a poor environment, of course, but having a local background as in the case of KZ may make one more attuned to worker concerns. So while KZ was praised, some others, I was told, had inverse situations, with poor environments but significantly higher pay. These are things that go into the equation, along with proximity to home, who you know that works there, and so on, when an Amish person is deciding which factory to apply to. 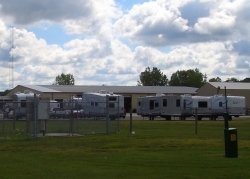 Poor work environment, however, is often cited as an issue by those who have left the RV industry for work elsewhere. Stress could probably be folded into the work environment category, but I put it here separately for a few reasons. I’ve never done it, but RV work seems like stressful work, and that is how Amish tend to describe it. There is a high level of production pressure, and Amish are paid well for achieving their objectives on the RV line. However work in a noisy, constantly-going factory is a far cry from, say, tending patches of black raspberries, a sideline business which one Amishman outside Honeyville is developing while he’s not in the factory (and, when I spoke with him last week, seemed to wish he could do full-time). Another drawback here would be the effects on family time. You’re away from home for a good chunk of the day. Of course, Amish in other lines of work such as construction are gone for even longer. One quirk of the industry, however, is that shift work usually starts around 4 AM. This means that men are waking up very early and then coming home in the early afternoon. Some see this as a good thing, as they have time to do things in the afternoon around home and family. Unlike a small business owner with a shop on the property, they can leave work behind and forget about it, and not expect any interruptions from visitors. Others see it otherwise, as men may return to nap for a couple hours just as the children are returning from school. On a related note, I wondered why RV shifts begins so early. I heard speculation that when the RV industry was first revving up, the 4 AM work schedule was meant to mimic a farmer’s milking schedule, though I am not sure if that is accurate. There is generally no second shift, so that is not the reason for the early start. Another factor contributing to stress is the degree of Amish dependence on the RV industry. Amish in northern Indiana are probably too reliant on RV factories, and I don’t think you’d get many objections from Amish to that statement. While Amish I spoke with feel it is a good thing that the industry has provided a means for many to support families, the fear that things could go south again must lurk at the back of many Amish people’s minds. One large Amish business owner I spent some time with last week emphasized the stability of work in his business. While he doesn’t pay as much as the RV companies, his employees know they’ll have work year-round. With fewer Amish businesses around there are fewer alternatives to turn to when RV businesses take a hit, such as in times of a poor economy of during fuel price spikes. Of course things can go bad in other businesses but the fate of the RV industry is well outside any Amish individual’s or church’s control. At least with the more nimble family-based Amish-owned businesses, one can adapt more fluidly to changing markets and you in turn have a greater measure of control over your fate. There has to be a measure of psychological health in that. When I see one of these massive machines with Jayco or Coachmen written on the side rolling down the highway, I still find it funny to think “Amish hands probably built that”. It’s another one of those quirky aspects of Amish society that surprise many people when they first learn of it. According to how many see things, Amish are still the plain and simple folk who tend the land and try to stay away from anything to do with the world, technology, or luxury. The recreational vehicle in and of itself embodies all three of those aspects in a very American machine, while also representing things like freedom, mobility and prosperity. Though Amish in northern Indiana might not be first in line to buy RVs, they have definitely benefited from the prosperity the business has brought to the region. The RV industry is certainly not a negative thing in and of itself, as it has brought a lot of material good to both Amish and English. Northern Indiana offers an example of Amish adapting to a different type of regional work environment. The situation in this area is unique. While there is factory work in other Amish communities, it is not seen to this scale or degree of Amish involvement in any other place. It also brings a separate set of issues which Amish in the area have had to adapt to. Amish in northern Indiana will probably continue to work in RV factories in large numbers for as long as they are around. Following the recession and unemployment years of the late 2000s and early 2010s, Amish are back in the factories and things seem to be plugging along as good as ever. Amish businesses which were started in those years have in many cases been sidelined as their owners have returned to collecting a factory paycheck. While the recession may not have sparked the founding of as many businesses in the area as I once thought it might, it’s likely the lean years have reinforced the need to spend prudently and sock money away for the next rainy day. Or at least one would hope so. This was very interesting. The photograph of the boat in the driveway was surprising to me. I’ve only seen that once before at an Amish home, and as it turns out, the homeowner’s business was upholstery. The boat belonged to an “outsider.” But I suppose that the more money one makes, the more he finds to spend it on, even when he’s Amish. For a while I have been aware that Amish men held many jobs in the RV production business. What I wonder is this: What other factories/businesses also hire a respectable number of Amish? We owned a large boat, about 20 feet or so. We weren’t using it like we had hoped to and put an add listing it for sale. On a Sunday afternoon, a Mennonite family (husband, wife, and 10 children), called and asked if they could look at the boat. We said sure. So his wife and I sat on the front porch talking. She told me all about her oldest daughter who went English. The kids and the dad looked over the boat. They didn’t buy it, but it was a great afternoon spent on the front porch. This Mennonite group is from Pelkie, MI. Logging is most of the employment. The trailer factories are generally non-Amish owned. I’m not sure if any have had Amish ownership or were founded by Amish. Skyline still has about 50/50 Amish/English employment in Sugarcreek. This creates some interesting issues working between those 2 groups. Business there is booming right now. I’ve been involved with the RV industry since the beginning and can answer a few questions. Most other industries in the area (we are home of orthopedic industry, too) will not hire Amish for the simple reason that a high school diploma is required, even for factory work. I’m seeing more Amish kids in high school now, so that may open more options. The main reason for a 4:00 a.m. start is to finish before the heat of the day. AC is useless in the large open buildings. Heat is a major problem for day shifts, although Indiana summers can be brutal for night shifts, too. As to Amish starting RV businesses, several founders had Amish backgrounds (like Mahlon Miller who started Newmar in Happened), but I don’t know of any who were Amish. As to quality problems, thousands are built, so there will always be issues. Plus, many of the issues have to do with what is supplied rather than what is assembled. These are complete homes with all the conveniences and problems related, plus add a vehicle and those problems. Sorry, did not notice auto-correct changed Nappanee to Happened. My wife says the gentlemans first name is Marvin. My husband and I decided to purchase an RV from our local rv sales company. We are both retired and wanted to live in a nearby campground as apermanent residents. When we picked up the camper we were told that several cosmetic issues would be corrected. Trying to get repairs made was received with the opinion “What do you expect…?” Trying to park the camper after waiting on repairs for a month, the circuit breaker crumbled in our hands. Had to wait another 2 days for warranty repairs. Uhhh. We spent $30,000. Damn straight. We expect a NEW camper to be in good shape, cosmetic or otherwise. We have been living in the camper for a month now. Various things are coming apart. Forget about any seams being flush. Most everything is off-center. It is truly shoddy craftsmanship. If this is what it means to Buy American, then we have lost a sense of pride in our products! I think it’s a good occupation for the Amish to be in when they are not doing well, with their own occupations. It lends another means of earnings coming into the household. On the other hand, I hate to see the whole Amish population resort to working in the RV Factories, in the future, and just hope and pray that they can continue their farming and other craft & skilled occupations, as they are so used to doing through their generations. We have an RV, and it was manufactured in N. Indiana; We have had some warranty issues arise (within 1 month of owning it! ), which these items should not have left the factory in this way. I have a fear that the workers (Amish and English alike) are not given the proper amount of time on the assembly line, to put all the parts & pieces together, for the finished product. I’m sure this is a stressful environment, because you are expected to work at a faster pace than what would be the ‘norm’ if you worked at home or on your farm, plus maybe leaving no time to “correct” something that you just finished, before it goes on to the next “area” of the assembly line. Maybe a follow-up to this article, Eric, could be interviews from the Amish themselves (if possible and if some are willing to share), on just how stressful those factories are. With so many RV repairs these days, (check out some RV repair facilities), I would hate to see the AMISH get a ‘bad rap’ because of their inferior work in RV’s. I don’t think they are to blame, but the industry itself is to blame, possibly lacking enough QC, tight schedules, or demanding too much of all workers. Just my thoughts that I have, since we are owners of an RV — am glad that we are helping the RV industry and putting people to work, by our purchase, as well as for our enjoyment of camping trips, every few months. Sharon thanks for sharing your perspective as an owner of an RV. It sounds like you got a lemon. Hope that worked out for you in the end. Your idea for follow up details is a good one. Will keep it in mind for the next visit. ERIK — Mileage on RV depends on what type you get — a motorhome, depending on size, could get anything BELOW 15 mpg — a Class C (type with truck chassis, with “box”), could be similar or better; We have a 24 ft Travel Trailer, pulling it with a RAM1500 with Hemi, and we get 8.5 mpg when pulling it. 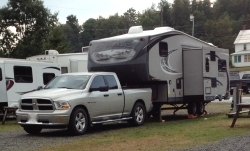 There is all types of configurations in campers/RV’s so mileage really depends on the unit and/or your tow vehicle. No, I don’t think we got a lemon — this is our 5th RV, and we’ve seen the quality of a variety of RV’s on the market, and there is no bad brand, but quality of workmanship tends to differ between brands, we’ve noticed. Our minor problems have been fixed (under warranty) and it is OK for now. We love camping, and after many years of camping, we don’t expect a “perfect” unit – even “top of the line” units can have problems. Sorry this comment turned into something totally off topic!! My comment from earlier still stands — I sympathize with the Amish who do work in the RV industries, because I know they really are probably glad to get home, once their day is done, at the factory! Peace and quiet, maybe some chores, and a good Amish meal waiting on them, hopefully! This is crazy work. Here is the short version of what it looks like when you work in the RV factory. And although Amish have a good reputation for quality work, i am not sure I would want one of these units. Haste makes waste comes to mind. I own an RV manufactured by Forest River and have owned it since 2009. It is a solid well made rv. We have traveled to Alaska, Canada, east coast and northern United States and were always very comfortable and stress free. I attribute it to the excellent workmanship by the Amish and English workers. Very interesting article. I had wondered about the non Christian environment because many Christians do struggle with it. I’m curious about transportation to and from the factories. Do the companies provide transportation for their non-driving Amish employees? Or do several employees who live in the same area form “carpools” with a hired driver? Or do some commute to work in buggies? I also wonder if this has led or will lead to urbanization, among this group of Amish. If you’re working in a factory, it would seem much more convenient to live in a house in town near the factory, rather than on a more distant farm. Multi-unit housing within walking distance to the factory would be more convenient still. Do any Amish in these areas live in more urban settings than we traditionally associate with Amish? Ed, a little slow here, I am not sure about companies providing transport, quite a few would get there on their own, and often by bicycle. There are some suburbia-type areas in Amish communities and in the Lagrange-Elkhart are in particular. Amish also live “in town” to a degree, though I wouldn’t call anywhere they live urban nor would I expect them to live in very built-up areas (I mean built-up city, not built-up county as is the case in a few communities). Most RV companies do not provide transportation for their Amish workers. Rather, they hitch a ride with English co-workers, or ride their bikes. “Drivers” are paid by the “riders” on a per trip basis. Going rate is $3-5 per trip. Seldom(never? )would they bring their horse and buggy, and leave the horse to stand all day! My recent (May) Shipshewana trip made me very aware of how dependent some Amish have become on RV production. Our local (Middlebury native) tour guide told us that it’s especially tempting for the younger generation (she mentioned young, unmarried men, especially) to be making so much money. That, and rubbing elbows with various “English” also working there (the “poor environment” that Erik mentioned) doesn’t make it any easier to live under the Ordnung. I’m not surprised by the high Amish employment. While it’s not easy work, it has to be very enticing to be able to walk into a factory and make very commendable wages from a young age. If I was in that position I would certainly consider it. Adding to that, this is a well-established industry so RV work is part of the local Amish tradition, with fathers and grandfathers having spent time in RV factories. As the men get older home businesses become more appealing as there is a desire to slow down a bit. There are no laws that forbid mortgages on “off-grid” houses. The catch is most banks in the U.S. sell their mortgages almost immediately to one of the three large quasi-governmental corporations — Fannie Mae, Freddie Mac, and Ginnie Mae which collectively “own” about 80% of the mortgages in the U.S. with the “originators” (the bank or mortgage company) just being the front man who collects payments. The three corporations in turn sell bonds to Wall Street investors based on their mortgage portfolios. Those big guys won’t make off-grid loans. That simply means the banks that originate the mortgages keep them themselves instead of selling them to someone else — and the Amish have an excellent reputation of credit worthiness. I’m sure the banks making the loans are smaller, locally owned banks rather than the big, impersonal national banks. As for taxes, yes there are income taxes. Typically local governments rely primarily on property taxes, state governments on sales taxes and income taxes, and the federal government on income taxes. Amish pay most taxes, but they are exempted from paying two old-age social insurance programs — Social Security and Medicare. They are also exempt from new mandatory health insurance requirements being rolled out with Obamacare. All three of those are tied into the income tax code. They’re also exempt from Worker’s Compensation Insurance when it’s an Amish employer employing Amish workers, but an Amish working for an Englisher or an Englisher working for an Amishman then the Worker’s Comp must be carried. The RV industry is boom and bust. I worked at Jayco for a number of years until a layoff in 2000. The entire work environment is built around the Amish, including stopping production to honor the 12 days of Old Christmas. Many of the boys are hired in when they leave school but only to push a broom until they reach 18 and can legally operate power tools in a factory. I follow a number of people who represent the tiny house movement. People are looking to downsize physically and financially. RVs would fit into this category. Perhaps that is why the RV industry is improving even though the US economy is still floundering. Just my 2 cents. Reply to Carolyn B – concerning the tiny house movement – RV’s are really not meant or constructed to be lived in as permanent homes, although a lot of people have had to do that, because of the economic conditions, past few years. I’m not sure of the reasons, but that is what I have read, in several places – Here’s one statement from http://en.wikipedia.org/wiki/Recreational_vehicle– “There are a large and growing number of people who live full-time in their RV/motorhome; these are known as fulltimers. This is not advisable as RV’s are not constructed to standards which would permit safe long term occupancy.” Not sure if this is because of glues used, or construction materials, etc ??? Not sure. Recreational vehicles or campers are much different than a Mobile or Manufactured home where these are constructed safely for permanent living. I think the reasons, that the RV Industry has once again accelerated, is because more baby boomers are now retiring or others are discovering that “camping” is a great way to explore the countryside and go on vacations, rather than staying cooped up in hotel “resorts” or going to expensive theme parks. Also, banks are lending again, and RV Dealers have ways to get the best financing for a buyer. Whatever the reasons for the increase in productivity, that is a good thing! It offers a place for anyone do make a living in these very challenging times! The RV industry is booming again in northern Indiana, as are the manufactured homes, but I’m not sure how it compares to the past since I’m no longer involved in it. The huge Fairmont Homes/Gulfstream Coach complex in Nappanee is minimalized partly as a result of a tornado hitting it several years back and the death of the founder, Jim Shea Sr. It looks to have been split between the kids. It still has manufacturing, but not the numbers of finished results sitting around as in the past. Many younger Amish moved away when things slowed down, but appear to be coming back now. The Amish schools are bursting​, and another large one was built a few miles from me. I’m seeing more of the Amish pleasure riding horses again, and many more signs of affluence. More Amish are going to the Nappanee schools, especially high school, to prepare for jobs. Actual Amish farming is almost non-existent, so outside work is a necessity. I am sorry to hear about RV problems some have had. Again I remind people that thousands are built up here, so there always will be problems, especially if the suppliers don’t provide quality items. I also remind people that RVs are recreational vehicles, not permanent residences. Legal requirements are established for each, and enforced as such. RVs are not built with the same standards as a permanent manufactured home. Movement over roads will cause loosening, as with any vehicle and add-ons. Maybe when the flying cars are available this can be alleviated. Thanks, Barb, for sharing some of your thoughts on the current status of “Amish Working in the RV Industry” in Northern Indiana. There are two very interesting articles written in the Fall 2009 Newsletter of Menno-Hof Amish/Mennonite Information Center in Shipshewana. One article was written by an Amish minister/former farmer/then an RV factory worker and the other was written by the Executive Director of Menno-Hof at that time. Both seemed to be saying that the layoff of many Amish from the RV factories was a “blessing in disguise”. The layoff was having a general effect of helping Amish people restore their connections to the land, and renew their focus on the strength of family, friends and neighbors. It would be very interesting to talk with these people who wrote those articles now (eight years later) to see if they think that the renewal of these values are evident today, now that many Amish have returned to the RV factories and have very good incomes. in which the two articles appear.